Flapping like our lives depend on it. Wait! This guy scored 290! 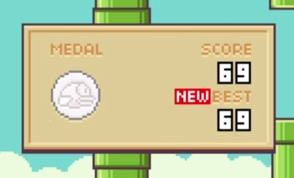 Before we went nuts and achieved this Flappy Bird high score, we set a personal best of 69. Little did we know that bigger and better things were on the way. That said, watching this video freaks us out a bit. We know the bird dies at 69, but the anticipation makes us shake our heads. If only we didn't make that mistake. With this in mind, we'll have more Flappy Bird scores throughout the week.